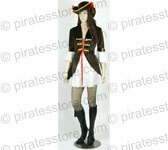 Very popular, historically accurate, romantically appealing and exciting pirate costume. Satin white under-dress covered with white lace. Attached brown military corset front with gold buttons, large striped sleeve cuffs with gold buttons and white lace cuffs. Pirate hat with two red bows.